In a meta-auto-behaviour-change effort both to keep me motivated during a very protracted PhD write-up and demonstrate that the end is in sight, I’m going to be publishing a few extracts from my thesis (mostly from the literature review, and before any rigorous editing) as blog posts over the next few weeks. It would be nice to think they might also be interesting brief articles in their own right, but the style is not necessarily blog-like, and some of the graphics and tables are ugly. Behaviourism as a psychological approach is based on empirical observation of human (and animal) behaviour–stimuli in the environment, and the behavioural responses which follow–and attempts in turn to apply stimuli to provoke desired responses. John B. Watson (1913, p.158), in laying out the behaviourist viewpoint, reacted against the then-current focus by Freud and others on unobservable concepts such as the processes of the mind: “Psychology as the behaviorist views it… [has as its] theoretical goal…the prediction and control of behavior. Introspection forms no essential part of its methods, nor is the scientific value of its data dependent upon the readiness with which they lend themselves to interpretation in terms of consciousness”. In an engineering sense, Watson’s behaviourism perhaps treats animals and humans as black boxes* (Sparks, 1982), whose truth tables can be elicited by comparing inputs (stimuli) and outputs (responses), without any attempt to model the internal logic of the system–an approach which Chomsky (1971) criticises. As Koestler (1967, p.19) put it–also heavily criticising the behaviourist view–“[s]ince all mental events are private events which cannot be observed by others, and which can only be made public through statements based on introspection, they had to be excluded from the domain of science.” However, learning (via conditioning) is inherent to behaviourism–both Watson’s and the later perspective of Skinner–which means that the black box is somewhat more complex than a component with fixed behaviour. Classical or respondent conditioning, of the kind explored with dogs by Pavlov (1927)–and often applied in behaviour change methods such as aversion therapy (as for example, the ‘Ludovico technique’ in Burgess’s novel A Clockwork Orange (1962))–repeatedly pairs two stimuli so that the reflex behaviour provoked by one also becomes provoked by the other. It is important to note here that in Skinner’s terms, positive and negative reinforcement do not imply ‘good’ and ‘bad’, and negative reinforcement is a different concept to punishment. Positive reinforcement is giving a reward in return for particular behaviour; negative reinforcement is removing something unpleasant in return for particular behaviour. These are subtly different. Pryor (2002) gives the example of a car seatbelt warning buzzer as negative reinforcement–a device designed to be irritating or unpleasant enough to cause the user to take action to avoid it. We might consider that a recorded voice saying “Thank you” after the seatbelt is fastened could be a positive reinforcement alternative. Positive and negative punishment are essentially the inverse of each of these–a fine for not wearing a seatbelt while driving is a form of positive punishment, and taking away someone’s driving licence would be a form of negative punishment. Clicker training with animals such as dolphins and dogs (e.g. Pryor, 2002) arguably combines features of classical and operant conditioning, using an audible clicking device to help ‘mark’ particular behaviours immediately they occur, which can then be positively reinforced with treats–or the click itself can act as a reinforcer. 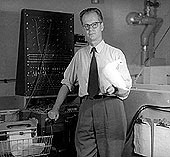 *A ‘black box’ approach to modelling human, animal and other system behaviour has also been discussed extensively within cybernetics, e.g. by Ashby (1956) and Bateson (1969). Platt (1973) and Cross and Guyer (1980) discuss ‘social traps’, situations in which there is both reinforcement which encourages a behaviour, but also a punishment or unpleasant consequences of some kind, affecting either the person involved or someone else, at some later point or in some other way. “The behavior that receives the green light becomes supplanted by or is accompanied by an unavoidable punishment…[C]igarette smoking provides a simple example: the gratification associated with smoking encourages future behavior of the same kind, while the painful illness associated with that same behavior does not occur until a point very distant in the future; and when, finally, the illness does occur, no behavioral adjustments exist that are sufficient to avoid it” (p.11-12). There are perhaps parallels with Bateson’s concept of the double bind (Bateson et al, 1956), in which a person is subject to conflicting ‘injunctions’ (reinforcers or punishments) about what ‘right’ behaviour is, with the result that whatever he or she does, will be wrong (and perhaps punished) according to one of the injunctions. Countertraps–what Platt (1973) suggests might be called ‘social fences’–also exist, where people avoid a behaviour because of (fear of) punishment or undesirable consequences, even though the behaviour would have been desirable. Often the reinforcer is a short-term, local gain, whereas the punishment is a longer-term effect, perhaps affecting a wider group or area: Platt cites Hardin’s tragedy of the commons (1968) as a well-known example of social trap with worldwide social and environmental consequences. Costanza (1987) examines how different kinds of social traps are responsible for a range of environmental problems. Cross and Guyer’s (1980) taxonomy of social traps is potentially interesting for two reasons from a design perspective, since (in common with some of the cognitive biases and heuristics to be discussed in a later post), design could seek to help users avoid such traps, by redesigning situations to avoid them (hence influencing behaviour), or in some way exploit the effects to influence behaviour, if they are useful in some other way. In Cross and Guyer’s taxonomy, there are five classes of trap (including countertraps), together with a ‘hybrid’ category for traps comprising more than one of the others: time-delay traps, where the time lag between a behaviour and a reinforcer is too high for it to be effective, e.g. “the high school dropout who, avoiding the present pain and unpleasantness of school, finds himself later lacking the education which could have prepared him for a more rewarding job” (p.21); ignorance traps, in which people fail to make use of generally available knowledge when making a decision, but simply rely on immediate reinforcers or superstitions; sliding reinforcer traps, “patterns of behavior [which] continue long after the circumstances under which that behavior was appropriate have ceased to be relevant, producing negative consequences that would have been avoided easily had the behavior stopped earlier… The trap occurs because the rewards establish a habit which persists in the succeeding period” (p.25); externality traps, where “the reinforcements that are relevant to the first individual may not coincide with the returns received by the second… If Peter spends five minutes in a cafeteria line choosing his dessert, he does not suffer for it, but all the people waiting behind him certainly do” (p. 28); and collective traps, which involve tragedy-of-the-commons-type externality traps, involving reinforcers or consequences for multiple participants based on behaviour by one or more. Cross and Guyer (1980, p.35) suggest ‘ways out’ of the traps, including their ‘conversion’ into trade-offs, “presenting the individual with a set of reinforcers that occur in close proximity to the behavior in question and which closely match the actual reward and punishment patterns that underly [sic.] the situation. The trap then becomes a simple choice situation in which rational and learned behavior are coincident. In some cases–particularly those of time-delay traps–this might be accomplished simply by altering the timing of reinforcers somehow bringing the punishment or proxy for the punishment into closer proximity with its causative behavior.” This could well be the principle behind a design approach to removing social traps, although it relies on being able to determine the structure of reinforcers and punishments which are affecting current behaviour, and somehow redesigning them accordingly. Reconsidering means and ends in this way may provide a useful alternative perspective on design for behaviour change. What may be an end from the user’s perspective (some kind of reward for turning off unnecessary equipment, perhaps) effectively becomes the means by which the designer’s end (the user turns off unnecessary equipment) might be influenced. The designer’s intended end is the user’s means for achieving the user’s intended end (Figure 1). If the end the user desires can be aligned with the means available to the designer, then the behaviour is reinforced. The mapping between ends and means (in both directions) may not seem to be one-to-one on first inspection. For example, the user’s end probably reflects an underlying need–not examined further in a behaviourist context–and likewise with the designer’s end. ‘Receiving feedback on my energy use in the office’–a favourite designer’s means for influencing reduced energy use–is probably rarely expressed as a desired end from a user’s point of view, but if successful at reinforcing conservation behaviour, it presumably fulfils some underlying psychological needs. Figure 1. The designer’s end and user’s means may be seen as reflections of each other, and likewise with the designer’s means and user’s end. Based on ideas from Studer (1970). 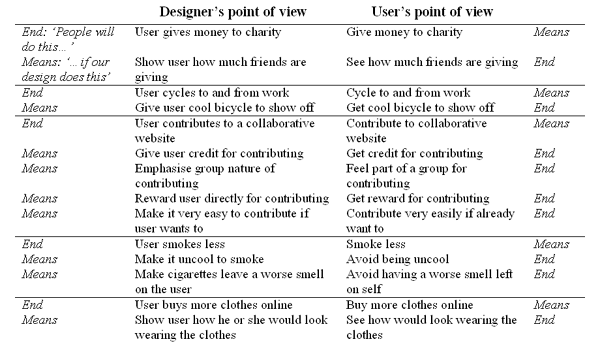 As an informal warm-up exercise in a workshop run at the Persuasive 2010 conference in Copenhagen, the author asked participants (designers and others involved with planning persuasive technology interventions) to map some intended ends relating to socially beneficial behaviour change, and some of the means they could think of to achieve them (Figure 2), using the labels ‘People will do this…’ and ‘…if our design does this’ for ends and means respectively. Figure 2. 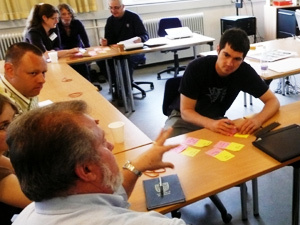 Some means-end pairings suggested by workshop participants in Copenhagen. Despite many of behaviourism’s principles having been adopted in other fields–not just animal training but therapeutic applications (e.g. with autism), athletic training, programmed learning via ‘teaching machines’ (e.g. Kay et al, 1968), to the emerging self-help industry (Rutherford, 2009)–it was largely supplanted in the mainstream of academic psychology by the ‘cognitive revolution’ (e.g. Crowther-Heyck, 2005), re-emphasising cognition as something to be understood as a determinant of behaviour. Pask (1969, p.21) refers to “the arid conflict between behaviourism and mentalism,” while Ericsson and Simon (1985, p.1) suggest that “[a]fter a long period of time during which stimulus-response relations were at the focus of attention, research in psychology is now seeking to understand in detail the mechanisms and internal structure of cognitive processes that produce these relations.” Images of Skinner-like scientist figures peering at rats pressing levers to obtain food, with the implication that this was what was proposed for humanity, to some extent cast a shadow of ‘the psychologist as manipulator’ over subsequent work on behaviour change–as Pryor (2002, p. xiii) notes, “to people schooled in the humanistic tradition, the manipulation of human behavior by some sort of conscious technique seems incorrigibly wicked.” Winter and Koger (2004, p.116) suggest that “[s]inister motives are attributed to those who would implement behavioral technology, and Skinner himself has been badly misrepresented and misunderstood as a cold, cruel scientist”. Regardless of the position of behaviourism in current academic psychological discourse, there are certainly elements which are relevant to design for behaviour change; indeed, the principles of reinforcement can be seen at work underneath many designed interventions even if they are not explicitly recognised as such. As Skinner (1971) argued (see quote opening this section), the environment shapes our behaviour both before and after we take actions, antecedent and consequence (even the absence of a perceived consequence is a consequence, in this sense). This is an important point, since much work in behaviour change focuses on one or the other. A system designed to suggest or cue particular behaviours, and then reward or acknowledge them, covers both intervention points, particularly given the fact that much interaction with products and systems is part of a regular schedule, and users do learn how to operate things through an ongoing cycle of reinforcement: behaviour change does not necessarily happen in a single step. The concept of variable or unpredictable reinforcement has potential design application in situations where a reward cannot be given every time, and also (as noted by Schell (2008)) in the design of games and game-like features in other interactions. The idea of shaping behaviour towards an intended state through progressive rewards for improvements in behaviour rather than every time has relevance in changing habits, which can be important in (for example) establishing exercise and healthier eating routines. Hardin, G. (1968) The Tragedy of the Commons. Science 162. Koestler, A. (1967) The Ghost in the Machine. Skinner, B.F. (1953) Science and Human Behavior. The Free Press, New York. Skinner, B.F. (1971) Beyond Freedom and Dignity. Sparks, J. (1982) The Discovery of Animal Behaviour. Collins. I must say, while the premise is ostensibly good, is there not an ethical or moral need to be overt and tell the general public, ‘hey, we’re manipulating you with this anti-insertsocietalwoehere design’? That’s a very interesting point, and many people better versed in ethics than I am have thought about this aspect, e.g. Luc Bovens’ take on the ethics of Nudge [PDF], Ida Nilstad Pettersen’s work (sadly behind a paywall, but it’s a great paper), Berdichevsky and Neuenschwander [PDF] and Peter-Paul Verbeek [PDF] (among others). Eventually I’ll be covering this area in another blog post as that bit of my thesis gets finished (nearly there). The most recent UK government report on behaviour change (from the House of Lords) [PDF] specifically considers the ‘transparency’ point you make, from page 12 onwards.